Oh, what magic is real life! Esbat Tammuz. I've previously posted (here and here) that my Hebrew letter tarot card deck contains 22 cards. There are actually 23 cards in my Hebrew letter tarot deck. I'd forgotten. I've had these cards for years and I deliberately didn't look at the face of the cards as I shuffled them during the only two tarot readings I've ever used them for to date. I have no thoughtful reason why I do that (carefully and purposefully not gaze at the face of the cards prior to "reading" them). I just have a thoughtbare reason beyond reason why I do it. The only time I see the face of the cards is as I read them. I didn't count them either. עד Moon 100% full in Capricorn, during the planetary hour of the Sun. nun and "the missing letter"
Like in the poem I republished last evening, Witch Dance (HaShetiyah), with 55 syllables (the gematria of hain הן) and a original web address "behold", "behold" was again iterated into my experience, with "tov" and "the missing letter" added to it this time. Behold, thy days of messianic consciousness must come ... where the "death" of Moshe is exactly the "birth" of messianic consciousness. Also, a threshing floor is used (I believe) in the old religion (Wicca) for dancing and for weaving spells. Meaning to harmonize and balance, unify elements. Maimonides writes: "The location of the Altar [in the Holy Temple] is very exactly defined... It is a commonly-held tradition that the place where David and Solomon built the Altar on the threshing floor of Arona, is the very place where Abraham built an altar and bound Isaac upon it; this is where Noah built [an altar] when he came out from the Ark; this is where Cain and Abel brought their offerings; this is where Adam the First Man offered a korban when he was created -- and it is from [the earth of] this place that he was created...."
1. Aramaic and Hebrew are the reverse vision of one another. 2. Angels cannot understand Aramaic (implying no angel mediation in reception of the word "idra"). Tuesday (today) corresponds to dalet. Yud is a vav not extended. At work today, the fire alarm went off, but there was no actual fire (ש) - just a malfunctioning smoke alarm in Zone 1. Interestingly, I didn't choose the cards dalet-vav-shin דוש, the shoresh of the word דיש. The cards I did choose did describe the odd event which did actually occur this afternoon. In my previous entry I discussed Bilaam's experience of prophecy with uncovered eyes, correlating "uncovered" to "unprotected", while Ibn Ezra posits "uncovered" to mean "open" in terms of "open" to receive prophecy. "Openness" would make sense in terms of receiving prophetic cursing, which Bilaam was hired to do. In the time of the Holy Temple, when the kohanim would bless the people, they would raise their hands over their heads and make a space between the third and fourth fingers of hands. When they recited the blessing using the ineffable Name of G-d, the Shechina, the Divine Presence, would rest on their hands. Although the Shechina no longer rests on the hands of the kohanim, to this day they still cover their heads and hands with their prayer shawls when they recite the blessing. But maybe we could also understand a different symbolism behind the covering of the kohens hands. Our Sages teach us that blessing only descends on things that are hidden from the eye, that the eye doesn't see. Thus, we can understand that blessings descend when, like the hands of the Kohanim, the eyes are covered. Consequently, the kruv which covered my lifted eyes this past Shabbat during the tarot reading, also brought to me blessings, which at that time were hidden from my "covered" eyes, where the Presence of the blessings only today I now see. In this week's parashah Balak, we learn that Bilaam experienced prophecy  while fallen and with uncovered eyes (נפל וגלוי עינים). Ramban believes  that "fallen" means that Bilaam experienced prophecy when he was in a sleep-like trance devoid of his conscious faculties, in contradistinction to Moshe who experienced prophecy in full possession of his conscious faculties. Rashi, citing Onkelos, believes  that "fallen" means that Bilaam's vision came to him at night when he reclined in bed. Ibn Ezra believes  that "uncovered eyes" means that Bilaam's psyche was open and conscious to receive prophecy. In contrast to these sages, I believe that the phrase נפל וגלוי עינים means that Bilaam experienced prophecy in an unrectified (fallen) and unprotected (uncovered) state. In other words, Bilaam's prophecy derived from unrectified da'at and was "not covered" (that is, not protected) by the kruvim, while Mosheh's prophecy derived from rectified mature da'at and was "covered" (that is, protected) by the kruvim. Interestingly, during my Shabbat tarot reading, sitting upright at my architech's desk, I lifted my eyes to my computer, in full possession of my conscious faculties to see the kruv, covering and protecting me. Consequently, my prophecy as a Jewitch derives from rectified, mature da'at and is protected (covered) by the kruvim. In short follow-up to this weekend's eight posts (so far), the things recorded have been silently spoken to me over (1004 = ד X 251) the Ark ( 251 = ארן) of Testimony, from between the kruvim (the tarot reading and the tarot reader, the reader engaging in the act of reading). זה, זה This Friday afternoon (erev Shabbat) prior to this coming Shabbat of Messianic Power, the moon is void of course into Capricorn from 12:08 pm to 5:05 pm CST. Effectively, the period of time where the moon is void of course will clear the path to "getting there" by annihilating all natural low magical operations which stand as obstacles in the way to "getting there". In parallel to the destruction of all obstacles, the void of course period brings into Capricorn the power and light of rectified Tohu, as described previously in Integrating The Light Of Tohu Bit By Bit. אתהפכא חשוכא לנהורא The moon will be void of course prior to fullness in Capricorn for a total of 297 minutes, where 297 is the gematria of "every land" וארץ. Thus, the prior Clearing and the rectified Light of Tohu brought into Capricorn will fill every land as the waters cover the sea. There will be a 1004 minutes where revealed feminine lunar energy is increasing in power and light between the end of the void of course period (5:05 pm erev Shabbat) and the full moon in Capricorn (8:49 am Shabbat). 1004 has a digit sum of 5, where 5 corresponds to the letter hei (ה). Thus, the period of increasing is likewise a window of revelation into the deep mind through the feminine letter hei. Dozens of dunams of fields and groves burned on Shabbos as brush fires raged throughout the western Galilee. The high temperatures made it difficult for firefighters to put out the blazes, and in some cases the teams were assisted by planes. The fires did not pose any danger to residents. Read the full article at link above. Zeh, zeh. In my previous post, I discussed the unique prophecy of Mosheh, as described by the word hazeh and given through the word hamateh, in relationship to both my dream this morning and to the tarot reading this evening. Significantly, while my discussion pertained specifically to prophecy (nevuah), both my dream and the tarot reading also pertain to the acquisition of Wisdom. Through my dream and tarot reading (both connected to the word hazeh through the 8 of wands/the hand of Binah/Understanding in the reading joined to the hand of Chochmah/Insight in the dream) nevuah and wisdom merged into a single stream of consciousness (mature Da'at, De'ah). "The Vilna Ga'on (Kol Eliyahu) and the Pnei Yehoshua answer that the Gemara (Nedarim 41a) says regarding wisdom (De'ah) that 'one who does not have De'ah, has nothing; one who does have it, has everything.'" Rabbi Yitzchak Ginsburgh teaches that "the only individual for whom wisdom and prophecy merged into a single stream of enlightenment was Moses. He was able to receive prophecy while still in full possession of his normative human faculties, thereby providing the quintessential model of rectified knowledge." In follow-up to my previous post regarding the ninth (ט) tarot reading I performed on myself, I decided to do the reading as usual without much forethought, just doing it. Shuffling through the cards to choose a card to represent me as the significator/querent (S/Q), the eight of wands gripped my eye immediately and without question as the one to choose. So I did, and it came to represent me in my ninth tarot reading just like the staff of Moses (ha-mateh Mosheh) came to represent Moses. HaMateh (המטה) has a gematria of 59, a digit sum of 14 (the same as yad, יד hand) and a final digit sum of 5, which is the numerical value of the final hei (ה) of the tetragrammaton. The eight of wands represents the upper hei (Binah, also associated with the number eight  through the letter chet ח) of the tetragrammaton. In other words, the united consciousness driving choice of the card (upper hei) and its active reception by the reader (lower hei) represents female symmetry. HaZeh (הזה), from the phrase ואת-המטה הזה, has a gematria of 17 (tov טוב) and a digit sum of 8 (i.e., the 8 of wands). Thus, et comes to add, through hamateh, haZeh (the unique level of prophecy attained by Mosheh). Ninth (ט) tarot reading just performed on myself using my standard spread and procedure. Looking up, I see the word kruv (cherub כרוב), a protecting angel and a vehicle for the Divine Presence, covering me from all harm. The cherub represents female symmetry, where the cherub of the tarot reading reflects over the tarot reader (me), and according to Rabbi Yitzchak Ginsburgh, represents the first step toward messianic consciousness. The letter beit (ב) in the position of Priestess and Chochmah corresponds to the situation of my dream this morning where Binah and Chochmah joined hands as sisters within the feminine psyche, producing mature da'at. Next shabbat morning marks the full moon of power in Capricorn, the mazal of my birth. The sign of capricorn is characterized by maturity of the Good Eye (Ayin HaTov), full rectification of nachash consciousness and transformation of nachash power into messianic power. After several years of both unemployment and significant underemployment where I worked part-time on Sundays in a job not commensurate with my experience, education or abilities, less than a month (חי days later to be exact) after performing the ritual segulah, my first day of employment orientation occurred on May 15 for a position dealing with data management and clinical reimbursement - a position more aligned with my interests, abilities and personality. I was a royal child of another clan, yet I was being set up by those holding power in the clan I lived among to be sacrificed. There was much action in the dream, but the theme running through all that action was basically that, in remembering my primordial unique word I regained my unique power (which was more powerful than my captor's power) and was able to escape. I spoke my word of unique power, escaped and flew away from the midst of those who were going to sacrifice me. But, as I observed from beyond the edges of that clan, I noticed preparations to sacrifice the next royal woman in line, since I had escaped. It occurred to me that she might be my long-lost sister, even though she had participated in the preparations to sacrifice me. So, I flew (like superman) back. Being uniquely powerful now, I was no longer in any danger. No one could capture me even had they tried. It was a given - I was beyond re-capturability. And, I was worried for the next royal woman in line to be sacrificed, thinking that she might be my long-lost sister. It didn't matter to me that she had participated in preparations to sacrifice me previously. She had been basically mindless then. Now, being prepared herself for sacrifice, her mind might be open to awakening. I approached my sister, spoke my own unique word of power to her, and asked her what her unique word of power was. I knew I would recognize my sister's word of power when she spoke it. She concentrated very hard, struggling to remember. A woman sitting next to her spoke up, telling me her unique word somewhat flippantly, distracting my attention from my sister. I didn't recognize her word. Her unique word was not in my family. I refocused on my sister, as she struggled to remember her unique word of power. I held out my hand to her, asking her again what her own unique word of power was. She blurted it out and clutched my hand. I recognized her word as the word of my sister. We flew away hand in hand from that place, both of us free. My father continues to do well 3 days status post coronary artery bypass graft surgery. Had there been a room available in the step down unit, he would have moved out of ICU today. He has now also reached the very important milestone of complaining about hospital food. Of course, my mother and I have also now laid down the law to him about seriously changing his diet. We are cleaning out the kitchen and purchased 3 new heartsmart cookbooks. He complained about that too. I've discovered yet another explicit connection between this week's parashah (Chukat) and my shabbat experience this past Friday night. The word chukat (חקת) is the 9th word of the Torah portion Chukat. The number 9 corresponds to the Hebrew letter tet and symbolizes a bed. While at first I tried to sleep in the bed this past shabbat, I ended up sleeping on the floor before/beyond (depending on perspective) a door in room 6. This past Friday night (zayin-et), I moved from the bed (chukat as the 9th word) to before/beyond the door (the final digit sum of chukat) in room 6 (where 6 corresponds to the central letter vav of haTorah). In other words, my explicit reality incorporates the entire phrase זאת חקת התורה and it focused that night into the central letter (kav b'emtza) of a vav-Torah. Reish. Today, I clarified it. Hei. And expressed it in writing. Here are some revealed explicit connections of this week's Torah portion (Chukat) with the events of my life this past shabbat. Though Chukat is this week's Torah portion (which began following this past shabbat), the verse  containing the word chukat (חקת) begins with the word zot (זאת). In the verse, the word zot immediately precedes the word chukat (the name of this week's Torah portion). The word zot can be separated into ז-את, a letter zayin (corresponding to the number seven) leading into the participle et. Grammatically, the Hebrew participle et "comes to add" something. The construct ז-את could be functioning to mark "something" intimately linked into the shabbat (the seventh day) which precedes the Torah portion Chukat (by way of preceding the word chukat in the portion), telling us that this particular shabbat "comes to add" something into the time which follows it. In other words, the shabbat preceding the Chukat portion anchors "something new" into reality, while the "time" of the Chukat portion itself catalyzes unfolding that "something new" delivered into it the previous shabbat into all reality. The shabbat which comes to add into time through the verse of the Chukat portion was this past shabbat, the night I spent in the hospital Guest House. ... in room 6 (corresponding to the letter vav and to Torah; a vav-Torah). I sleep in Beauty and walk in Truth. Interestingly, my dream this morning - Shamanic Heartwalk, Unifying Covenants - has correspondences with the Kiphonus Gate of the Temple Mount. The Kiphonus Gate is the only gate (on the western side of the Temple wall) which leads directly (through a 50 foot tunnel) to the Temple Mount (Har HaBayit). Importantly, my dream links to this 50 foot tunnel beyond the sealed up Kiphonus Gate which leads directly to the Temple Mount. The rainbow light sensor of my dream corresponds to the boundary of the sealed up Kiphonus Gate which few may pass beyond. The upwardly curving lighted road beyond the rainbow light sensor of my dream corresponds to the 50 foot tunnel beyond the Kiphonus Gate. The Light of The "Place of Making" Requests in my dream corresponds to the Kodesh HaKadoshim (Holy of Holies). 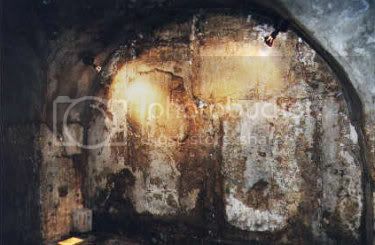 Hat-tip to Mystical Paths for picture under the kotel. Last night following my father's cardiac surgery yesterday morning, my mother and I were hosted in the hospital's Guest House for families of ICU patients who live out of town. The Guest House was so clean, everyone had to wear surgical booties over their shoes to walk in it. We slept in room 6 (as my father slept in the cardiovascular ICU on the 8th floor). The Guest House was elegant and the beds were gorgeous, but I couldn't sleep. My mind was occupied. It was too quiet. I tossed and turned for a few hours. I normally sleep to the hum of a fan. There was no fan in the main room, but there was an exhaust fan in the bathroom. The bathroom with the humming fan in it was off to the side beyond a small alcove next to the room's door. I was walking as one among a group of travelers to The "Place of Making" Requests. The roadway was dark and tunnel-like. Moving on, branches joined to the main arteries of travel. There were checkpoints along the way where travelers were assessed to determine who could travel on beyond that particular point toward The "Place of Making" Requests and who couldn't. There was no actual procedure of assessment, but each person was judged by the atmosphere in the environment, sort of. There was an assessment but no assessor. A person either could or could not move on beyond that point. If a person couldn't move on, it was as if it was put into the person's mind to drop out of the journey. At each checkpoint, some in the group would drop out, while the rest of us would move on. At each checkpoint, the group got thinner and thinner. Finally, we came to the checkpoints where few and fewer could go beyond and most dropped out of the journey. The dark main roadway curved around and up like a rampway, like an aorta or an interstate exit ramp might. At the base of the upwardly curving road, as one stepped up onto it, one had to pass through a light sensor made of a rainbow. Very few were able to pass through the rainbow and enter upon the curvature where the darkness of the main road began to lift. I stepped through the rainbow and upon the lighted curvature that was now the road. With each step, more and more dropped out of the group, but I continued on. Curving around, I came to a place on the right hand side called The Place of The Kohen. It was another checkpoint. There may or may not have been anyone else in the group with me now. I was not alone, but I was not cognizant of any particular others being there. I passed through this checkpoint and continued on beyond it. Passing beyond The Place of The Kohen, the road curved further around and into The Light of The "Place of Making" Requests. I stepped forward into The Light of the "Place of Making" Requests. My father's heart surgery and the immediate 24 hour recovery period have both gone excellently. He only had to have a triple bypass, lost no significant amount of blood, had no complications, and was extubated yesterday evening. He was up in the chair for a few hours this morning (tolerating it well) and has been weaned off the Dobutrex and Nitroglycerine. He's even faithfully using his incentive spirometer. Everything has gone amazingly well and for this, I give thanks. Luis, the second (ב) letter of the Celtic ogham, is a Duir hafucha and corresponds to the letters L and lamed (ל). Luis encompasses the entire Torah (לב), from the last letter to the first letter in the order of midat harachamim by number and vibration. As an upside down duir, luis forms the gate (ח) to the mysteries. From the Song of Amergin, Luis "is a flood across a plain." From Dichetal do Chennaib, Luis "unriddles him a riddle" using "the key cast away." The mystical power of luis is the ability to distinguish good from bad. In other words, the mystical power of luis is discernment, a function of Binah whose transcendence is represented the letter chet (ח), the gate to the mysteries. Thursday evening, the evening before my father's heart surgery on Friday morning, marks the new moon (ב) in Gemini, where the planet Mercury and the letter pei (פ) rule Gemini, and where Gemini corresponds to the letter zayin (ז). Taken together, these three astrological letter correspondences have a gematria of 89, the same gematria as the hebrew word פדה meaning "redeem". My father is a firstborn son. My own firstborn son was born C-section. I will be performing a new moon esbat redemption ritual (a modified Jewitch's pidyan haben) Thursday evening for my father. The form the ritual will take is yet to come. I just returned from the hospital. My father had a nonemergency cardiac catheterization this morning. The procedure went uneventfully, but he is going to have triple-bypass (at least, possibly quadruple bypass) heart surgery this upcoming Friday morning. Please add my father to your prayer lists. My new employer is very happy. Our census is now at an all-time record high. This means that incoming revenues are correspondingly at an all-time record high. Really high. No one who has worked there for any period of time even remembers the census ever being this high before. This also means that I've been very busy at work. But, I really like my new job and all the people there. It's an excellent facility. When Moshe ascended to heaven to receive the Torah, each of the ministering angels, even the Angel of Death, taught him a secret. The Angel of Death's lesson was that the incense can check a plague. And Aaron took as Moses spoke, and ran into the midst of the assembly; and, behold, the plague was begun among the people; and he put on the incense, and made atonement for the people.